During dinner the conversation I was having with a Thai friend Dain, turned to the subject of ghosts. I knew about ghosts having been visited by three in my life, my wife knew all about ghosts having grown up with them in her Kowloon culture and our Thai host had been brought up to fear them and saw them everywhere. 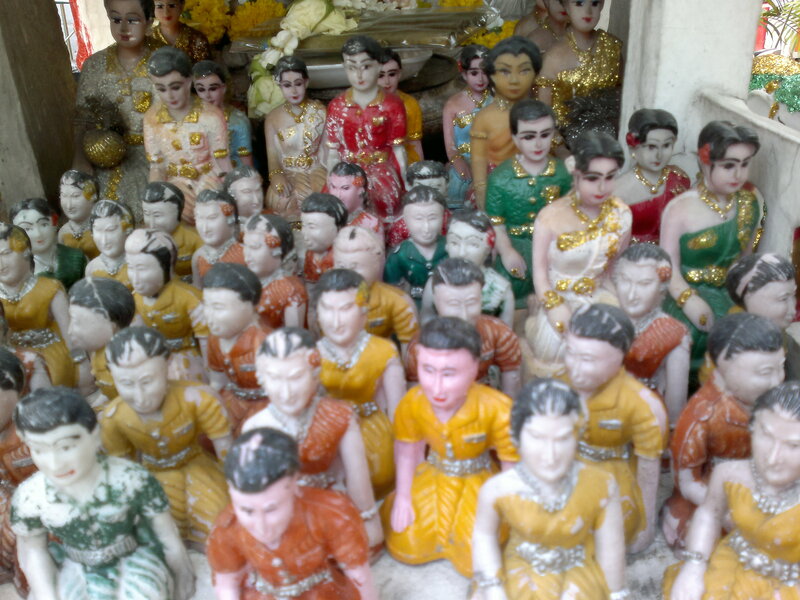 This was of course Thailand, where ghosts and spirits are accommodated on every property and feature prominently on almost every corner lot where gaily painted spirit houses are richly kept to placate the wandering spirits of the dead and displaced. That Thailand is a Buddhist country is not in question but it would be more specifically described as a neo-Buddhist Hindu Animist culture coexisting in a Buddhist country. Thailand has a long history of occupation and migration. Spiritual beliefs were brought with the various peoples we now know as Thai from as far away as India, Indonesia, China, Burma, Laos but particularly Cambodia from where the Thai imported their complex social culture and affectations from the Hindu Jayavarman dynasty. All brought religious beliefs and practices with them when they came, not all spirit worship practices and previously existing beliefs were willingly put aside for the sake of geography and politics. 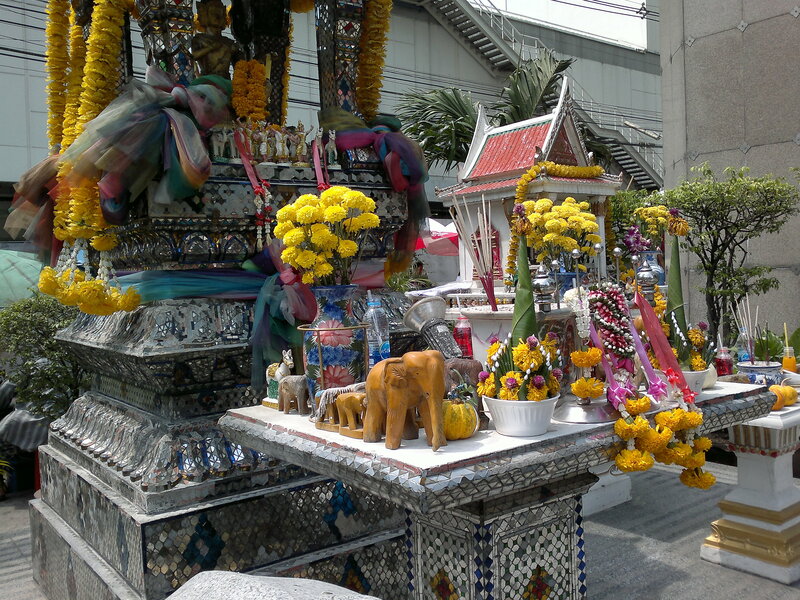 Spirit belief has always been common among the peoples of Asia. Their beliefs have probably come down as metaphors for the natural world that they needed to understand in order to adapt and survive. But ghosts are not part of the psychology of migrating people or the phenomenon of transhumance, not to me anyway. In Thailand ghosts are as real as the nose on your face. As I said , I’ve witnessed the manifestation of three distinct spirits and have a long relationship with an unseen forth who has been a constant influence throughout my life. Two of the spirits I have known I will not speak about, their energy is far too negative and I hesitate to call them back into my world. The third is a woman who seems to think of me as a guide. She first appeared to me in the hallway of a house where I was living in Honolulu. This tiny cottage was the last of it’s kind after a confusing phase of construction threw up high rise building in every corner of a once placid neighborhood that had stood alongside the Ala Wai canal for generations. The cottage was an anomaly in Waikiki. Now I think it was the energy of the place that had rejected the developers by putting them off as long as it could. Her spirit is a young Polynesian woman who seeks to find that which she has lost. I do not think she seeks material objects but rather a meaning to her life and answers to questions that remained when she met her end. Somehow my energy serves as a gateway to wherever she wanders in her quest. Our relationship calms her and is ongoing in a manner of speaking. I have been confronted many times by those who insist they don’t believe in ghosts or the existence of a spirit world. My answer to them that their lack of understanding is because they are themselves as uninteresting to the spirit world, in essence, their spirits are lacking energy. Spirits seek out particular people with unique energy signals compatible with the existence of a fourth realm that coexists along side the temporal world. I based my novel ‘The Enablers’ on my personal knowledge of spirits passing through a membrane of extra dimensional energy to exist in our world temporarily. Some spirits seek to stay longer than their allotted time. Desperate spirits who want to stay in our temporal world have been known to become malevolent as they become increasingly frustrated by the impossibility of exiting in both worlds simultaneously. It is my belief that this has resulted in spirit possession and misinterpreted as entirely evil. I do not believe that all spirit forms are evil. Dark energy exists as a cosmic physical phenomena, a counterpart to positive in the physical makeup of chaos. People tend to overlook their knowledge of these things, yet we refer to them every day. Good and bad, black and white, yin and yang. This is instinctual understanding that modern people have become so accustomed to that they take the existence of such things for granted even though we negotiate between the two choices as part of our daily lives. Of course Dain was horrified that I had such a close physical relationship with the spirit world. “It’s very dangerous ,” she said. I agreed that there had been difficult times when the physical and psychological state of what I am was altered by forces beyond my control and that I had experienced trans-dimensional shifts in place and time. I explained to her how I had learned to astral-travel as a child and that it had crossed my mind that I had attracted my spirit companions while innocently passing through the spirit world as a novice medium. Of the three of us telling ghost stories over dinner that night, she was concerned enough about my safety that she traveled to a special Buddhist monastery the following morning and sought the advice of a revered temple Abbott who was knowledgeable on the subject of spirit possession. She came back the next evening with a question for me. “Why do you think the spirits are visiting you?” I responded with what I had always assumed was the reason. “Because I’m a dreamer,” I said. I went on to explain that I had only lived with my mind open, never closed by influence or opinion. Dain told me everything the monk had said to her. He had confirmed that I was a soul adrift between worlds. He cleansed her by chanting magic over her and gave her a secret mantra to take away and silently repeat whenever she chose to be in my presence. “He said you attract the ghosts,” Dain told me. I agreed that was true. I had never denied the other world a place in my own. I felt as if she was reading off a list of qualifying questions the monk had prescribed for her to ask. He wanted to be sure that I could answer certain sacred questions ‘the right way’. I suspected that he may have been considering that I was a wraith manifest in human form and was perhaps haunting Dain or her environment. It wasn’t long before I saw a wave of relief wash over her, as if she had finally satisfied herself that I was of this world and not another. The Monk had prepared a magic charm for me in the form of an amulet. The relic had been pressed sometime before 1682 towards the end of the life of a powerful mystic named Luang Pu Thuat in a temple renowned as a force against evil and in particular acting as an intermediary of wandering spirits known to cause accident. Dain reverently strung the charm around my neck while chanting her mantra and visibly sighed in relief , “You’re safe now,” she said as if she’d just performed a draining exorcism. “Remember this mantra,” she said. I repeated the words she had brought from the monk until I had memorized the ancient chant, ” Namo Bodhi Satho’, ‘Namo Bodhi Satho.’ We repeated the mantra together for several minutes in fervent prayer with hands folded over the amulet between us , pressed together in blessing. I felt strangely relieved and said so. The tiny earthen figure of the revered Bodhisattva enclosed in an ingeniously constructed protective case, Luang Po Thuat, had surrounded me with his holy medium Dain explained. He would act as the intermediary between myself and the spirit world from this point on. “Just don’t take off the necklace,” she said pointedly. I had noticed that it was waterproofed. The monks amulet has been around my neck ever since the day it was hung around my neck by someone who cared deeply about my well-being. The direction and context of my life is still a mystery and sometimes very strange, but this may be because everything I have done up to this point has been the product of the random influence of a spirit I had accepted as my personal guardian angel early in my naive youth. If I am finally in control of my own destiny I will need time to unwind the outcomes of what had been wrought in my other life by my trickster spirit guide in order to get on with a new path of my own choosing. I have not ceased to astral-travel nor can I close my mind to a world I know exists beside the one I see. Some day I will remove my Luang Po Thuat necklace, just not today.